Nature's Plus Herbal Actives Black Cherry Review – Scam or the Real Deal? The importance of maintaining healthy joints is essential to body mobility and flexibility. As well as ensuring the ability to effectively perform daily tasks, joint health products reduce the risk of gout caused by the build-up of crystallized uric acid. Joint discomfort associated with gout can cause severe pain. Effective joint treatments can remedy irritation and promote a healthier lifestyle. 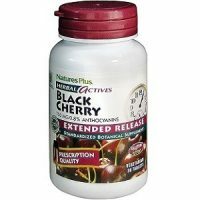 We have reviewed Nature’s Plus Herbal Actives Black Cherry Extended Release Tablets to determine the product’s ability to combat gout and return joints to a healthy state. 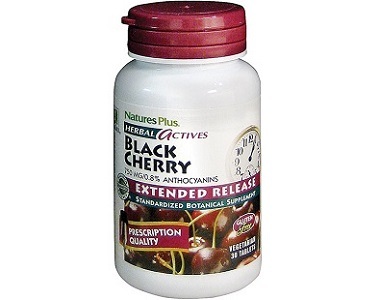 What’s in Herbal Actives Black Cherry Extended Release Tablets? This product includes one key ingredient – Black Cherry (Prunus cerasus/serotina fruit). This antioxidant combats the development of free radicals which inhibit the bodies ability to deal with the buildup of crystallized uric acid in the joints. Naturally containing anthocyanins, cyanidins, and ursolic acid; this product maximizes the synergy of the whole berry for greater absorption and an extended release delivery system. While this ingredient promotes healthy joints and fights gout, it cannot be used as an only defense against joint discomfort. Other ingredients such as Turmeric, Folic Acid, and Milk Thistle are all beneficial ingredients in gout-alleviating supplements and should be included in effective solutions. How Do You Use Herbal Actives Black Cherry Extended Release Tablets? As a dietary supplement, these tablets should be consumed orally once (1) daily for best results. The high concentration of black cherry extract is potent and provides beneficial results when taken this way. A 30-tablet bottle can be purchased online via third-party sites. This product can be purchased at a 15% discount for $11.60 and a further 5% discount for $11.02 per bottle when purchased in a set of three (3) via one third-party seller. This product can be found at an even further reduced price of $9.74 from another retailer. Prices vary depending on which online store you are purchasing from so it is important to compare third party sites and their individual shipping solutions to find the best deal. This product does not include a guarantee but is backed by an Independent Laboratory Assay. This supports its effectiveness, giving consumers peace of mind regarding the efficacy of the product. That being said, the number of short-term reviews do not indicate the long-term effectiveness and potential side effects of this product. Without further indication of long-term usage we cannot accurately ascertain the prolonged potential of this product as an effective remedy to gout. 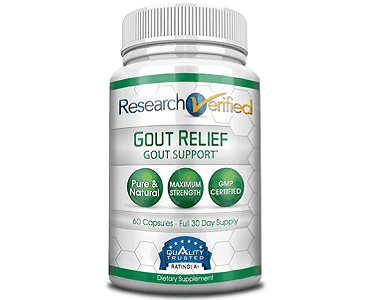 The extended release properties of this product make it an effective dietary supplement for additional gout relief support however, the single extract cannot be wholly relied on as a total-care solution. While the Independent Laboratory Assay backs the product, it would be more beneficial if the product was supported by a guarantee. This would further indicate confidence in the product’s efficacy. While the product is affordable, it is for the above reasons that we cannot recommend it as an effective treatment for gout.